Army Wives said goodbye to another one of their own in this seventh season finale. Read on for a review of "All or Nothing." 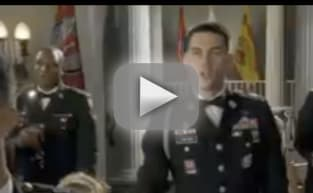 Realities of life back on base are hitting the soldiers on Army Wives. For some it's better than others. Read the review for more! The characters we know and love on Army Wives came home alive, but another life was hanging in the balance at the end of the hour. Read the review for more! This week on Army Wives we experience some of the most intense field fighting scenes we've ever seen on the series. Read the review to see how it plays out. Army Wives takes a moment to dedicate Claudia Joy's reflection pool, but the rest of the episode was a jumbled up mess. Read the review for details. On Army Wives, the ladies try to get the rest of the money for Claudia Joy's memorial park, while the men in Afghanistan are hit by a mortar attack. Kat Young made her entrance on Army Wives this week, interruptinf the lives of both Joan and Michael. To find out what else went down, check out the review! Army Wives delivered a very strong and emotionally driven episode with "Losing Battles," reminding us why it's been on the air for seven seasons. Read the review for details. Army Wives introduces us to Jackie's son just one week before he heads to Afghanistan. Who will miss him more, Jackie, Gloria or the viewers? We're still getting to know our newest recruits on Army Wives and things are looking up and getting back to normal. Read the review for more. Army Wives used a couple bombs as plot devices to get to know the characters. It wasn't as excited as you would have thought. Check out the review for more. Army Wives says a final goodbye to Claudia Joy and welcomes new recruits to Fort Marshall. Read the review for thoughts. Give me everything you've got, baby doll, or you're gonna be looking at me from the floor. Michael Holden: Claudia Joy Holden, after 17 years of marriage my heart still skips a beat every time I look at you. Claudia Joy Holden: Michael James Holden, after 17 years of marriage I can't believe that tired old line of yours still works.